All countries have the logistics data they need to effectively manage their health supply chains leading to healthier communities. Collaboratively develop shared, open source software to improve health commodity distribution in low- and middle-income countries. Public health supply chains need accurate, timely logistics data from health facilities to make decisions about procurement and supply. Too often this information is inaccurate or simply not available. As a result, health systems in many countries continue to experience stockouts of essential medicines, leaving people vulnerable to treatable illness and diseases. In many cases, countries have had to build and support their own custom logistics management information system solutions or rely on costly commercial systems. Globally, this approach is expensive, inefficient, and often results in inadequate solutions that become increasingly difficult to maintain over time. Countries are not able to leverage the work already done by their neighbors, and instead have to “reinvent the wheel” when new features are needed. Inadequate resources for ongoing country-level maintenance have led to information systems that are outdated and unable to effectively handle the growing number of health programs and products. The OpenLMIS community, repository, and software are the result of a collaborative process from multiple stakeholders working together to create an innovative electronic logistics management information system (electronic LMIS) that fulfills the needs of multiple countries, particularly those in low- and middle-income contexts. 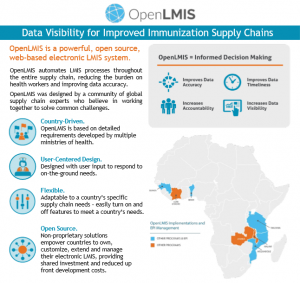 The OpenLMIS initiative seeks to improve supply chain efficacy in low resource communities to ensure that people—no matter where they live—have access to essential medicines and supplies when they need them. A concise introduction to OpenLMIS and an overview of its impact.